This 7.5 inch diameter heliochronometer was milled out of aluminum and set to the site latitude with a mounting plate. One heliochronometer arm has a sun illumination counter sunk hole 0.125 inch in diameter and on the other arm an engraved analemma for proper pointing offset to display civil time. Time marks are milled at 5 minute intervals, and a vernier is added (5 lines 4 minutes apart) so that time can be read to the nearest minute. 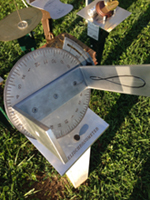 The dialist George Lips has been making sundials as a hobby for 20 years. After obtaining a small model heliochronometer from the Franklin Mint and was amazed at how accurate it was. He decided to make one. The dial was made using a Trak A.G.E.3 mill. Another of his horizontal dials is shown in the last two photos.